Welcome to Boston 2017 Sessions! See further for abstracts the SBL site. Welcome to MSR sessions in San Antonio! 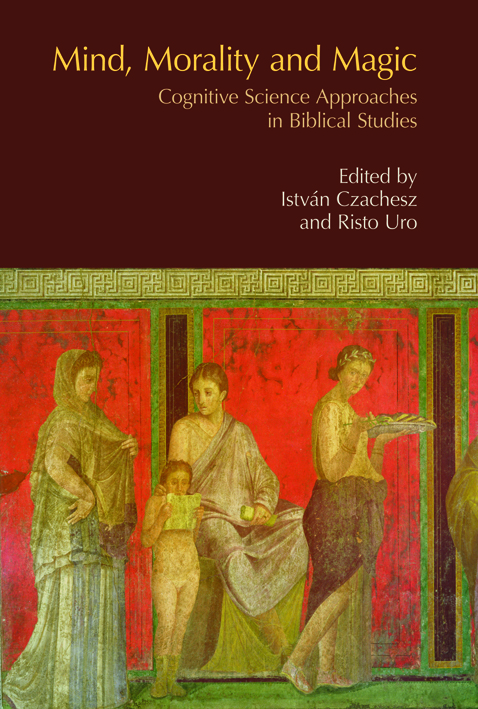 (3) “New Books on Cognitive and Ritual Approaches to the New Testament and Early Christianity“, jointly with Ritual in the Biblical World unit. For the 2016 Annual Meeting, (1) we welcome proposals that address any of the research foci stated in the description of the program unit. Furthermore, two sessions with invited papers are organized. (2) In a joint session with the Qumran Section, speakers will explore how cognitive science of religion theories and perspectives might shed new light on the Qumran texts and how the Qumran evidence might be incorporated into the larger enterprise of making sense of religious behavior in human history. (3) In a joint session with Ritual in the Biblical World Section, a book review session with invited panelists will discuss two new publications: Risto Uro, Ritual and Christian Beginnings, Oxford University Press, 2016 and Istvan Czachesz, Cognitive Science and the New Testament: A New Approach, Oxford University Press, 2016. The dead line for proposals through SBL website is 1 March 2016. The Mind, Society and Religion in the Biblical World sponsors two sessions in the SBL Annual Meeting, Atlanta, 2015, both taking place on Sun 22 Nov: (1) a general session of four papers, and (2) an invited session on Cooperation, Manipulation, and Violence: Evolutionary Perspectives on Ancient Texts. Note also on Sat 21 Nov the AAR session with primatologist Frans de Waal on Morality Without Religion: Empathy, Fairness, and Prosocial Primates. See the detailed program under “sessions” on this website. The SBL 2014 Annual Meeting schedule has been published. The schedule of the MSR sessions has been added to the program details on this website. Note also the special session on “Cognitive and Evolutionary Approaches to Early Christianity” organized by the Redescribing Early Christianity seminar, featuring presentations by Risto Uro, István Czachesz, Anders Klostergaard Pedersen and Petri Luomanen. See the program of this session here. The Mind, Society and Religion in the Biblical World sponsors two sessions in the SBL Annual Meeting, San Diego, CA, Nov 22-25, 2014: (1) a special session devoted to discussing Patrick McNamara’s book, The Neuroscience of Religious Experience (2009). This session will be organized jointly with the Religious Experience in Antiquity program unit; and (2) a general session of four papers. (1) “Past minds: Using cognitive science in the historical study of religion.” This session will look into the opportunities and difficulties involved in using cognitive science to deal with historical (textual and archeological) data. What are the prospects and challenges of using cognitive science for understanding ancient cultures and societies? Is there a way to integrate interpretation and explanation in the historical study of religion? Is it possible to use contemporary brain studies to understand ancient minds? We look forward to paper proposals that critically examine the theoretical challenges by providing relevant examples. The session is co-sponsored with the Cognitive Science of Religion section of AAR. (2) Mind, Society and Religion in the Biblical World and the Religious Experience in Antiquity program units are planning a joint session that will engage Patrick McNamara’s Neuroscience of Religious Experience (Cambridge, 2009). McNamara’s book examines the neurocognitive basis of emotion, ritual, self-construction, and religious language and concepts as they relate to religious experience. This is not a review session per se, but rather a session that either applies some aspect of McNamara’s work to particular ancient texts and movements, or critiques its relevance to ancient religion. We invite papers that will engage aspects of McNamara’s work as they relate to the experience of religion in antiquity. Papers will also be peer reviewed for possible publication in a special issue of Religion, Brain, and Behavior. (3) For the third session we accept proposals that address any research focus stated in the description of the program unit. Paper proposals must be made via the SBL online system. We are proud to inform that Mind, Morality and Magic: Cognitive Science Approaches in Biblical Studies has been released. The book is a comprehensive volume on the application of cognitive science to biblical materials. The cognitive science of religion that has emerged over the last twenty years is a multidisciplinary field that often challenges established theories in anthropology and comparative religion. This new approach raises many questions for biblical studies as well. What are the cross-cultural cognitive mechanisms which explain the transmission of biblical texts? How did the local and particular cultural traditions of ancient Israel and early Christianity develop? What does the embodied and socially embedded nature of the human mind imply for the exegesis of biblical texts? The fifteen chapters of Mind, Morality and Magic draw on a range of approaches to the study of the human mind – including memory studies, computer modeling, cognitive theories of ritual, social cognition, evolutionary psychology, biology of emotions, and research on religious experience. The volume explores how cognitive approaches to religion can shed light on classical concerns in biblical scholarship – such as the transmission of traditions, ritual and magic, and ethics – as well as uncover new questions and offer new methodologies. István Czachesz & Risto Uro (eds. ), Mind, Morality, and Magic: Cognitive Science Approaches in Biblical Studies. Durham: Acumen 2013. ISBN: 1844657337. Discount price £ 60. Visit publisher’s website. Read a free sample including the introduction here. Open book cover image here. Welcome to the new website of the “Mind, Society and Religion in the Biblical World” program unit. The website is currently under construction.